Author’s Note: I wrote this review way back in February and for no particular reason it kept getting left in our drafts file. We didn’t know if we should post it because it is so out of sync chronologically with our blog. However, it is very much in sync with the information it provides. I checked out their facebook page to make sure they are still open and found this inspirational interview with the owner. It sounds like that in just over a year they are getting great recognition for their hard work of running a restaurant and going to the extra work of sourcing locally. Each year we close our restaurant for the last two weeks of January. This year we decided to learn new things by attending the Southern SAWG (Sustainable Agriculture Working Group) Conference in Little Rock, Arkansas. Prior to arriving, I looked for restaurants that would be a good fit for our Real Local Cooking Restaurant Reviews. The Root Café stood out as my number one choice to visit. The owner’s commitment to the local food movement was demonstrated even before they opened their doors last summer. 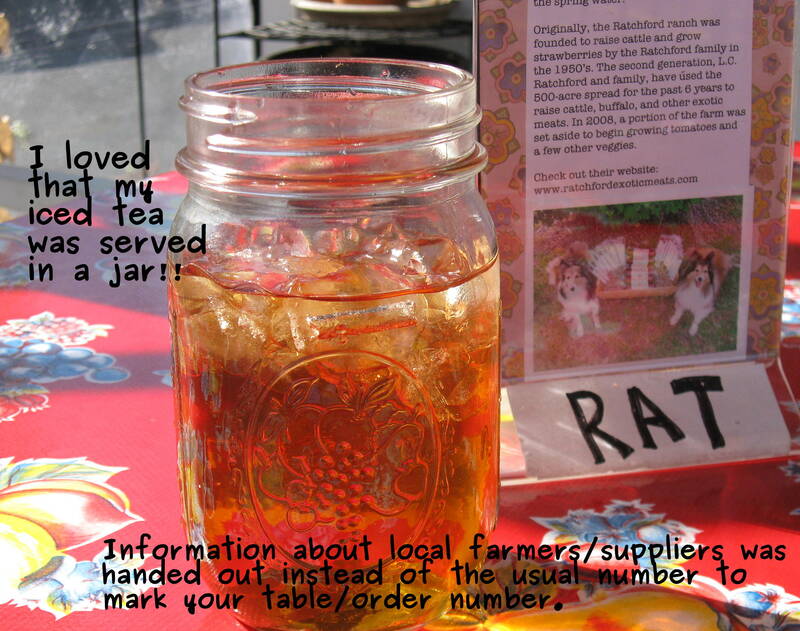 According to their blog, they set up a table at a local food club starting in January of last year. They sold locally-roasted coffee, home-made canned goods, muffins, pastries, and pan breads made with local ingredients such as Arkansas black apples, pecans as well as blueberries and strawberries which were preserved by freezing the previous summer. Since The Root Café was located close to the adorable cottage we rented, all I had to do was travel a few blocks to find the part of town known as SoMa (which stands for Southside Main). It’s a historic district that strives to be a livable, walkable community that offers a mix of residential, commercial, retail and other services. While in the neighborhood I also visited a creative park (that used to be an empty city lot), the Green Corner Store (a shop that offers products for sustainable living), and a bakery called Boulevard Bakery. Yes, The Root Café does source their meats and veggies from local farmers. A few days later, I heard the owner speak in one of the sessions at the conference. He shared at least 12 local farms from where they source their products. 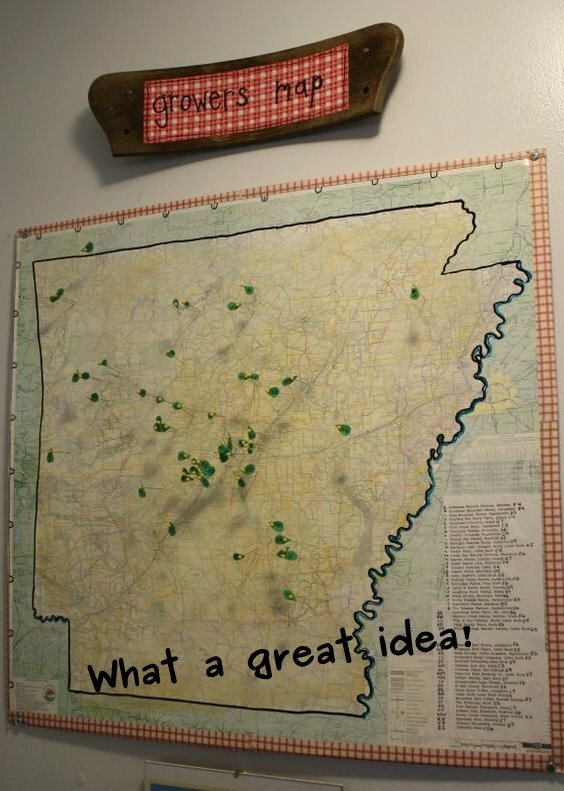 There’s also a map of Arkansa s that has pins to represent all of the grower they support. All of their bread and buns are from Boulevard Bakery, which is right in the neighborhood. They also have edible landscaping that includes herbs used in the menu in season. I ordered an Old World Style bratwurst which according to the menu is made from local, small-farmed and pasture-raised pork and served on a Boulevard bun. 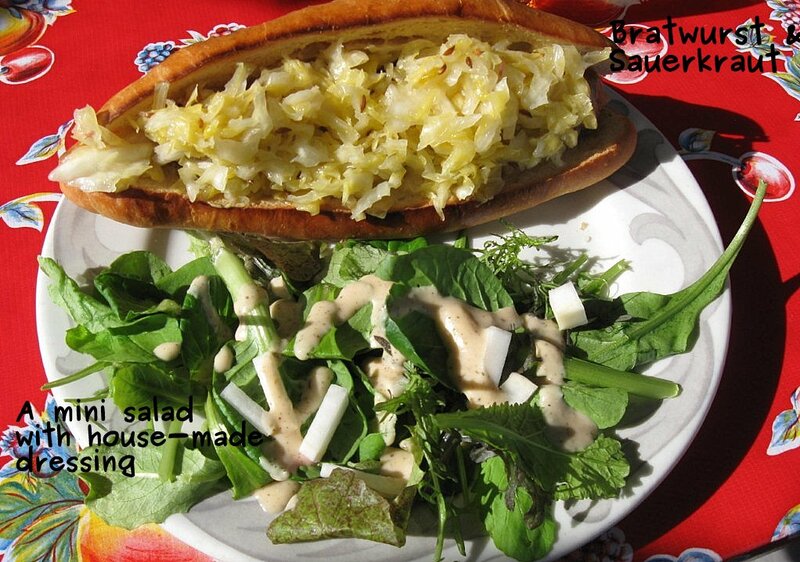 The bratwurst was served with homemade sauerkraut and Dijon mustard. The meat was seasoned nicely but the sauerkraut didn’t have much kick to it (it tasted like lightly pickled cabbage instead of strong sauerkraut). Their menu offers somewhat standard cafe items, reubens, ham and cheese, burgers, salads, but there are a few inventive dishes that I haven’t ever tried before. For example, a vegetarian banh-mi sandwich; if Luke was with me, I know he would have tried that because he loves Vietnmaese style banh mi sandwiches! My order came with more than I thought I was getting. I assumed it was just the sandwich and the sauerkraut, but on the plate next to the bratwurst was a nice pile of micro greens with a tasty homemade dressing and some radishes. It was a nice to munch on some greens with my brat. The Root Café is not fancy. It is a former drive-in style with a wooden porch added onto the front. They had put up plastic tent-like covering in order to provide extra seating in the winter; the place was busy at lunch and the extra seating was needed. I sat outside in the front corner and soaked up a little sun while I waited for my food to arrive. The Root lives up to their sustainable focus by using real plates, former canning jars as glasses and best of all, cloth napkins, but not the ones that are so starched and stiff they are difficult to use. These napkins where mismatched, colorful and and well worn, perhaps they were even procured at a local thrift shop. All these accoutrements added up to make me a happy camper. You might prefer a place where they wait on you and you don’t have to sit outside in a plastic tent, but not me, I like this kind of casual and unpretentious little restaurant. When in Little Rock, I highly recommend rooting out The Root for good food, local food and a cozy atmosphere.